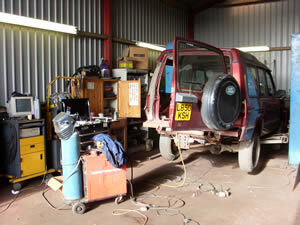 At Seton Engineering we are specialists in 4 x 4 repairs. As one of the leading independent specialists in the repair and servicing of Land Rover, Range Rover, Discovery and Freelander vehicles in Central Scotland we have many years of Land Rover service experience and use the most up-to-date technology. Our service is not limited to four-wheel drive vehicles, we also carry out repairs and services for other cars and trucks. From M.O.T. preparation to any kind of accident repair, bodywork and paintwork you would like to get carried out, please do not hesitate to get in touch with us for a free estimate. We are here to help you with work carried out to the highest standards.